Our new intern for the summer is Mikaela Davis from Graceville, Florida. Mikaela is a senior Global Business major at Troy University and is interning with us to learn about the business side of agriculture and to gain experience in the field. Mikaela is getting married in November to her fiancé, Ashby, and is graduating from Troy in December. 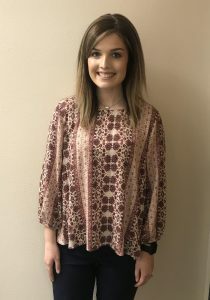 Mikaela is looking forward to a great summer here at FPPA, getting married and graduating, as well as moving back to Graceville after graduation to begin her career in agriculture business (and helping out on the family farm, of course).